After months of engagement with Federal and State Ministers for Consumer Affairs and other political representatives, Keep Me Posted obtained to have the issue of paper fees put on the agenda of the Consumer Affairs Forum (CAF) held in August 2017. Ministers decided that Treasury would undertake a consultation to explore the opportunity to amend the legislation and enhance consumer protection. Throughout December 2017, Treasury was seeking contributions to a national consultation into paper billing fees. The consultation paper explored the costs and benefits of 5 policy options, including the prohibition of paper fees, option 2. 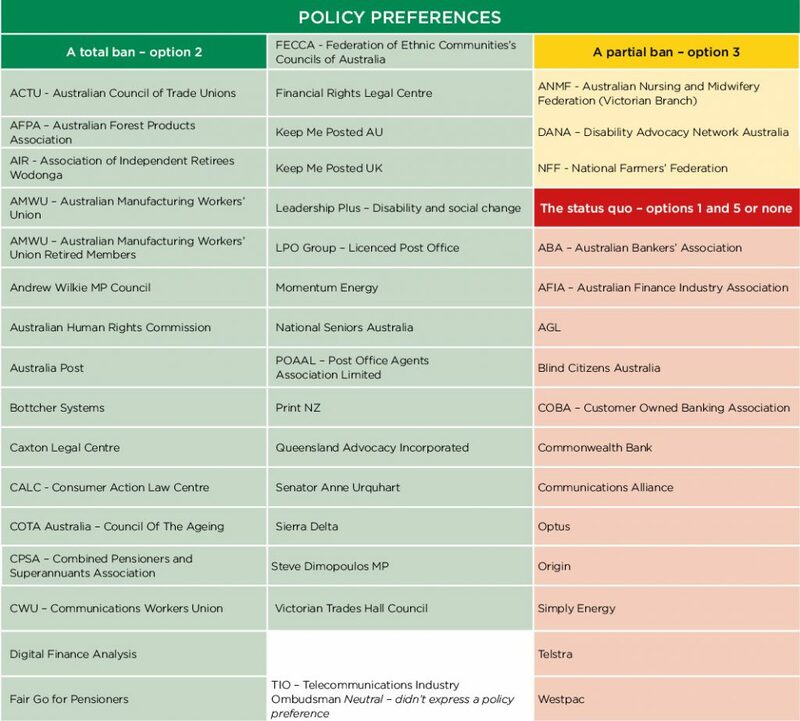 In its submission, Keep Me Posted unequivocally supported option 2 as the only option that can guarantee consumer protection against unfair and discriminatory charges. Click here to read Keep Me Posted’s submission. 57 public submissions are currently available on Treasury’s website. Click here to read Keep Me Posted’s analysis. A Consultation Regulation Impact Statement (RIS) and Decision RIS will be prepared ahead of Ministers formally considering the issue in the first half of 2018. Watch this page for the latest updates about the consultation. For more information write to keepmeposted@twosides.org.au or call Keep Me Posted on 03 9421 2209.